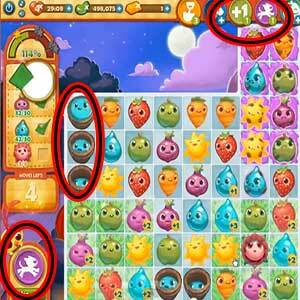 These Farm Heroes level 242 cheats and tips will help you beat level 242 of Farm Heroes. 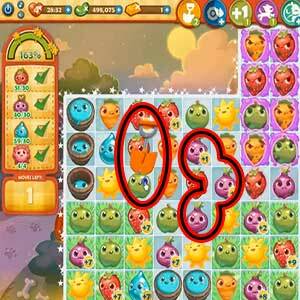 The objective of Farm Heroes level 242 is to collect 30 strawberries, 30 onions, 30 water drops, and 4 flowers in 20 moves. The first thing you will notice on this board is the amount of frozen crops present, this makes matching a little difficult because you can only thaw frozen crops with their identical match. Use the magic shovel booster early on this level to remove crops in blocking like combinations with frozen ones. Grump crops can also be used to free frozen crops. Being that their are a large amount of water drops on the board, they should be the first crop cleared. With that being said you can use the color collect booster to clear the rest off the board temporarily to make room for other crop combinations. In this level you do not have to collect green apples, you can use the magic shovel towards the end of the level and remove them if they are in the way of other matches. 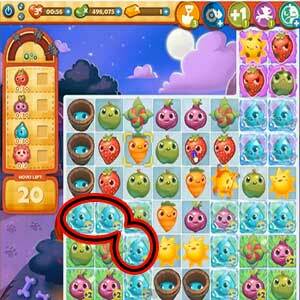 You can also try to match crops with extra points on them, this will add to your total high score.